I'm still in denial that Rescue Beauty Lounge is no more. If I'm being honest, I'm just pretending it's not true and that there will be a new collection announcement any day now. But, in case my prayers go unanswered, I'm definitely glad I snagged a bunch of polishes before Ji Baek closed the brand for good. 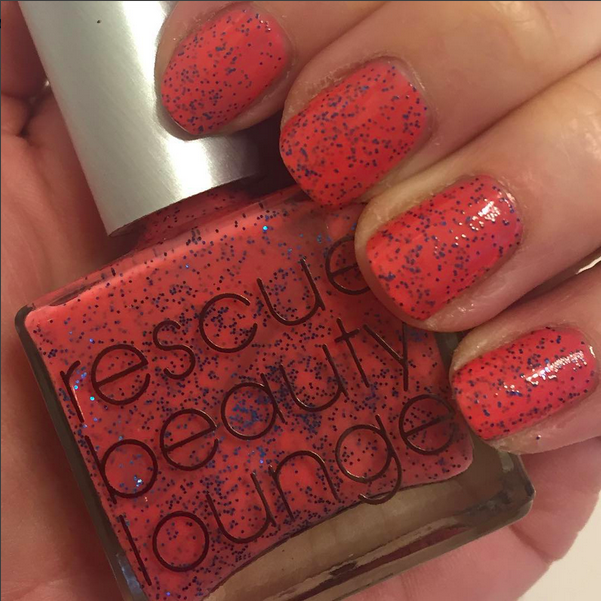 And one of them was Rescue Beauty Lounge Refined and Polished. This is one of the colors from the Bloggers 3.0 Collection that launched in October. It also happens to be the kind of color dreams are made of. For starters, the coral-salmon hue is to die for. It's that kind of color that's equally perfect in warm weather or cool, equally gorgeous on fingers and toes. But it's the royal blue microglitter that truly makes this polish a stunner. I'm a major fan of nail polishes with buildable glitter, and this one has it in spades. Each coat brings more glitter to the nail while creating depth with the one previously painted. I used two coats for a more unique look, although one is already fairly opaque. It's similar in formula and texture to Deborah Lippmann Polka Dots And Moonbeams, which is one of my favorite shades. I love the color combination, too -- the salmon and blue hues really complement each other well. This is definitely one of those colors that has me staring at my nails over and over! And, okay ... if RBL really had to close, at least this is one of the colors that helped that happen with a bang. I was shocked to see them close shop and missed out on a lot of shades. This is a nice one and I love the blogger who created it! I have some RBL that I just love. I'm not a glitter person but I appreciate it on others. I love the contrasting microglitter on the coral polish. Sad to hear they've shut shop. This is just so sad! This is such a gorgeous polish! That polish is something else. I'm kicking myself that I never bought any RBL. My nails are bare b/c I desperately need a manicure. That color is pretty. I love the speckled look of the glitter. Cute! I'm planning to do my nails tonight with this polish! !